If No One Reads; Would You Write? Be Known for Something : Discover Your Church Communication Thread / Business Essentials / If No One Reads; Would You Write? I’m often reminded how we do things only if we are rewarded. You eat because it tastes good and it solves your hunger. You buy virtually everything for it’s benefits. iPhone = Organization and Networking. Clothes = Covering/Comfort or To Look Good. So why do you write things down? You probably want to influence people with your words. Or to remind yourself or others what you’re thinking right now. 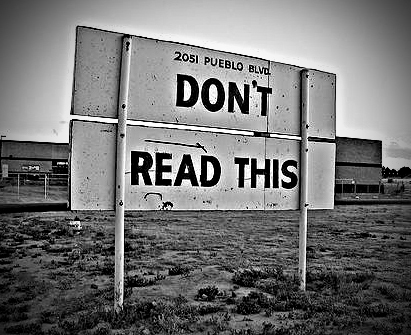 But what if you found out that no one reads. How would that affect your writing? If you don’t get a benefit; than there’s no sense doing it! According to Pew Research (2012); people are in fact reading books. People (age 16+); read an average of 17 books/year. That sounds high to me; however, anyone in school must read which skews the number of books read upward. Infrequent readers (1-5 books in the past year) amount to 31% of the people though. When it comes to reading though, most people (84%) like to read on paper. For e-books; only 15% say they prefer them. Granted, that appears to be increasing drastically (up from 4% in 2010). However, 18% of Americans haven’t read a book in the last year. One thing I know, is that MOST people don’t like reading paragraphs on website pages — unless they’re a website that is intended to supply book or news materials. Metrics from average websites show people are looking at a page for only 10 seconds. Or less. If the average American reads about 300 words/minute; that’s about 50 words. Analytics also say that if you have much more than 50 words (except for a blog where people will read about 300 words); they’ll pass over the information even faster. So what’s the lesson? Stop writing when you hit the 50 word limit on each web page. And don’t go over 300 words in a blog. That’s why I’ll stop right now.